I have been baking with a lot of fruit this summer. It is not something I usually do, but I have been enjoying it immensely. Maybe it's because I'm baking more in general, so it is only natural that fruit would find it's way into the batter, given how bountiful it has been. I stumbled across this recipe in the June issue of Gourmet magazine. It was the buttermilk that caused me to tear the page out of the magazine and stick it on my big old recipe pile. For some reason I am fascinated with buttermilk. I didn't grow up with it, although I do have at least one memory of my father chugging down a nice cold glass of it. It looked nice and refreshing, but I have since taken a taste of it straight out of the carton and I can tell you that refreshing is not the word I would use. Tart? Yes. Thick? Yes. Refreshing? Not so much. But I love to cook with it. I have finally found a buttermilk pancake recipe that is within a stone's throw of perfect. I am thinking of making my flaky biscuits flaky buttermilk biscuits. I have used it to moisten my potato and onion galettes (of which more later). And add two tablespoons of it to a cup of heavy cream, let it sit out for a few hours until it has thickened, and you have creme fraiche, which has certainly made my life a better place. But in this instance, buttermilk gives you a rich, moist, delicate cake that has a light crumbly texture and almost melts in your mouth. The original recipe calls for raspberries, but blueberries are so abundant and inexpensive around here right now (at least at the grocery store - they're more than twice as much at the green market I am sorry to say), that I have been using them in all kinds of recipes that call for other fruits. And it works beautifully in this recipe. 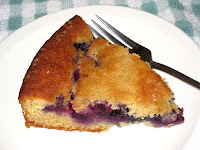 I healthied up this recipe by using half white whole wheat flour and half all-purpose flour. It stayed light and moist, but there was just the slightest hint of backbone that in my opinion held up quite well against the blueberries. Preheat oven to 400 deg. F. with the rack in the middle, then butter and flour a 9-inch round cake pan. Whisk together the first five ingredients, then set aside. Beat together the butter and sugar with the hand beater on medium high. Add the vanilla and mix it in. Next add the egg, making sure to beat it in completely. With the beater on the lowest setting, add a third of the flour mixture and just beat it in. Add half of the buttermilk and just beat that in. Repeat with another third of the flour, the rest of the buttermkilk, and the rest of the flour, beating just enough to mix it in after each addition. Spoon the batter into the cake pan. 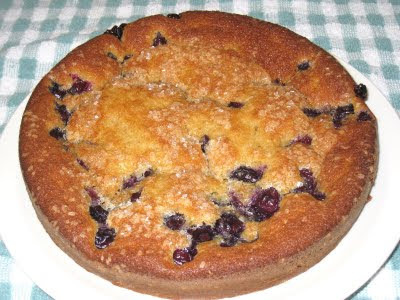 Smooth the top, then spread the blueberries over the batter. Sprinkle the large-crystal decorative sugar evenly over the top. Bake for 25 to 30 minutes, until the cake is golden on top and a toothpick inserted into the middle comes out clean. Let cool for about 10 minutes, then turn it out onto a rack and let it cool another 15 minutes or so more. Invert onto a plate before serving.